Metorik	is ready to help you get the answers you need. Metorik	will reply to your questions about Get extension name	shortly. We appreciate your feedback about your support experience with Metorik, developers of Metorik. This helps us maintain high standards on the WooMarketplace, and helps Metorik improve. Glad to hear it went well with Metorik. Tell us more. Did Metorik get back to you? Do you have any additional feeback for us or Metorik? In just a few clicks, Metorik gives your store a powerful real-time dashboard, unifying your store’s orders, customers, subscriptions, and products, helping you understand your data and make more informed decisions every day. Cool! “I’m absolutely blown away by my first interactions with Metorik. Game changing interactions and data for WooCommerce. I am in love.” – Brian Krogsgard, Post Status Founder. “A very powerful analytics tool for WooCommerce stores!” – Mark Forrester, WooCommerce Founder. Need more confirmation from the 1000’s of WooCommerce stores using Metorik? Check out our customers page here. Complete 30-day trial – no credit-card required. Email / Slack digests – beautiful, insightful reports automatically sent to you and your team ever day. Customer service integrations with Zendesk, Help Scout, Freshdesk, and more (letting you see your store data while answering support tickets). Google Analytics integration – giving you access to conversion rate data and growth over time (read more here). Powerful exporting of segmented data and automated exports. Integration with the official WooCommerce Subscriptions extension – reports, filters, and exports for your subscriptions data. Automatic guest/customer handling (read more here). Unlimited team members with multiple roles / permissions. Unlimited stores under one ‘company’ (subscription). Live chat support with the founder, Bryce Adams. Metorik spins up detailed reports and charts faster than any other tool available. In addition to that, the load on your site’s admin dashboard is reduced since you can do everything from Metorik, as such making your site faster. Save your precious server resources for customers. How do you measure success and figure out if your business is heading in the right direction? Most stores use KPIs – key performance indicators – to get a bird’s eye view of their business. With Metorik, you have access to real-time metrics like your average customer LTV (lifetime value), the average numbers of items per order, and the average order value. On a product-level, you can easily see sales per product, per category, or even per variation. Learn more about Metorik’s reports here. Metorik offers a robust & powerful segmenting system, allowing you to filter your data by anything and everything. When you’re done segmenting, you can export that data to a CSV (automatically, if that’s your thing). You can even save the segment for next time, or share it with your team. Want all customers who have a LTV over $80 and purchased a product from a certain category? Easy. Orders that were made in the last 30 days where 3 items were purchased and the customer was from the UK? Easy. Customers who haven’t ordered in 6 months and live in California? Easy. How about finding subscriptions that your customers cancelled this week? Easy. Read more about the segmenting system here. Send targeted, customised emails to customers as soon as they meet certain rules, like when they haven’t ordered in 6 months or when their subscription is about to be renewed. Every email sent is tracked, allowing you to see reports about open rates, conversion rates, and more. At the start of every week you’ll receive a weekly Engage summary by email. 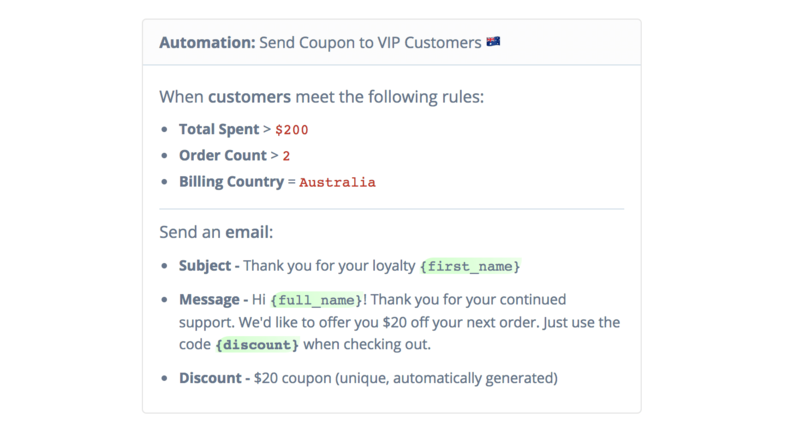 And you can even generate dynamic WooCommerce coupon codes to include in each email! Learn more about Engage here. Your customer service team is going to love Metorik, thanks to the integrations available for Zendesk, Help Scout, Freshdesk, and Intercom (with more to come). Metorik integrates with your existing support system to show customer data right alongside support tickets. Data like their contact information, lifetime value, order history, products purchased and more, instantly at you and your customer service teams’ fingertips. Additionally, you’ll find data from your support systems shown on order pages and customer profiles in Metorik. To learn more about Metorik’s customer service features, head here. Every store cares about different metrics. With Metorik, you can customise the heart of your store – the reporting dashboard – to suit your personal needs. Metorik has complete custom dashboard support. Better yet, you can save multiple custom dashboards, share them with your team, and easily switch between them in seconds. If running a store is hard, staying on top of what’s happening in a store on a daily basis is impossible. Fortunately, Metorik’s digests feature makes this a piece of cake. You can automatically receive reports summarising your store’s activity on a daily, weekly, and monthly basis. They can be sent by both Email & Slack, and include your KPIs, charts, best sellers, and more. Learn more about digests here. All data can be exported from Metorik at any time in minutes. You can even schedule exports to happen automatically as often as you’d like. Exports are also customisable. You can choose to include just certain columns, export one row per order line item, or even include custom meta data. Bonus: These exports have zero-impact on your site whatsoever. No more server downtime! Metorik supports the official WooCommerce Subscriptions plugin, offering subscription filtering & exporting, along with reports like MRR, Churn, Retention, Forecasting, and more. You can even have an automated subscriptions digest sent to you every day summarising everything subscriptions-related. Learn more about Metorik’s subscriptions integration here. 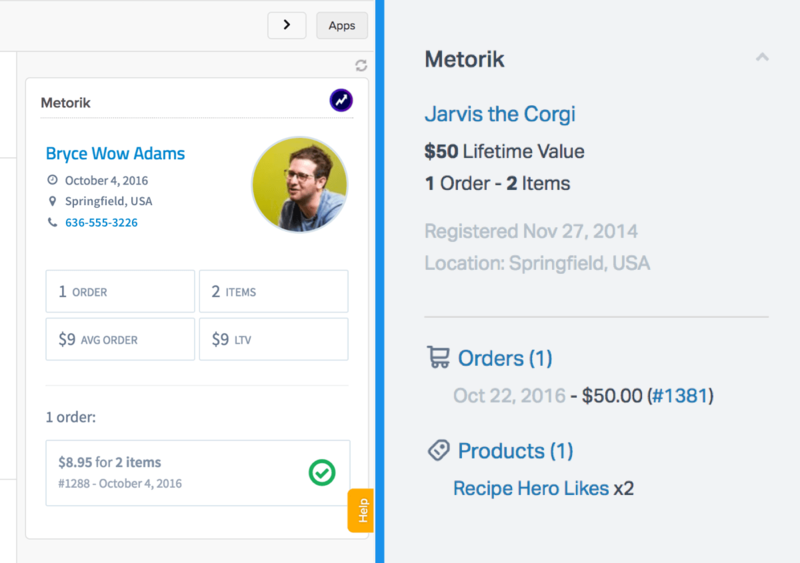 Whether you’re running a store solo or bringing your team, Metorik has your back through its team system. Each store can have unlimited team members at no extra cost, each with their own role & permissions. No more sharing sales reports with your support reps and no more analysts updating orders by accident. Yes! There is really so much more to Metorik than what you’ve seen here. Just have a look around the Metorik website to get an idea of how valuable Metorik will be for your store. You don’t need any technical experience to get it connected. No code, no zip files, no functions.php. Just click a few buttons and Metorik is ready for you!